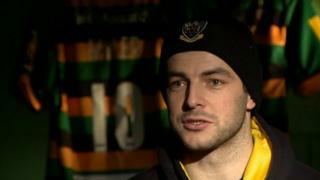 Northampton Saints fly-half Stephen Myler tells BBC Look East he has been waiting for an opportunity to impress for England for "as long as I can remember". His club team-mate and Wales international, George North, says he is surprised a player of Myler's quality has not won more than one cap. Myler is in the England training squad for the Six Nations alongside fellow number 10s Owen Farrell, George Ford and Danny Cipriani.